For a few weeks we have been having the real important people of Chennai city on my show on Aahaa FM. Sri Nataraj, DGP (Prisons) and Additional Commissioner of Police Mr Sunil Kumar were on my show taking calls from the general public. On that note we shall be having Mr. Lakhoni, Chennai Corporation Commissioner on our show tomorrow. If you have questions to ask him, please post them here, and I shall make sure they are answered. As for the server it is going to be down. Aahaa FM will not go live for quite a long time. First of all let me congratulate for your achievements. It was good to read about you in Hindu. We are facing a lot of troubles from our neighbour who uses the road, nearby open ground etc for their business which involves constructional materials like Sand, Jalli, bricks, cement etc. Ours is a 100% residential area but these people never bothers about it and run their business. The place is highly pollutted with dusty smoke by the above said materials and noise pollution due to loading and unloading of the same. Also they use lorry for transporting and frequency of these vehicles and the noise is another big trouble. To guard their materials they have a dog which they tie it up in their terrrace in their night. It barks for the whole night. This problem could be too silly for the commissioner but for the people residing here particularly senior citizens and babies and kids it is a big trouble. Complaints to police is ineffective. The police is benefitted because they get their share when ever we do the complaint. How can our commissioner help in this? Here is my question to the Commissioner. Sir why cant we implement some stringent rules to keep our city clean? Take the people who spit on the road. The punishment should be something like taking them to their bedroom and make them spit over there. I remember the brand new Thambaram subway, the pure white wall turned to red with all paan over it in a matter of 1 week.People who spit over there must be handed over with some water and made to clean it. Only if something like this happens people will have fear. What stops our lawmakers on implementing such laws? 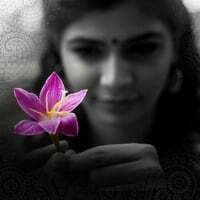 Hi Chinmayi, You rock. Lovely to see the initiatives and would like to help and support you if you need an extra pair of hands. I live in Guindy off the Vandikaran Street - There is a TASMAC shop that serves the spirits till late night and all those who go there, come to my road, Ranganathan Street(ganesh nagar), to gulp the damn liquid and what more... urinate in my area. I drive so it's fairly easier to cross the place but there are a lot of girls who use the road after work... They find it difficult. This is a major irritant and I wonder when the damn shop will be closed for good. Can you help by asking this question? This is not a one off incident... there are many roads that suffer the same way. How would the commissioner help us girls, especially? Majority of roads in chennai city do not have clear lane markingss for traffic for pedestrians and signal stops. How will a motorist imbibe lane driving and discipline when no such markings exist ( in majority of roads)? we need safe roads and user friendly roads. I hv got a ques for the chennai commisioner. I have been residing in Ramapuram area for past 3 years. The state of road to ramapuram from mount poonamalle road (towards eswari engg college)has never changed and is with a lot pot holes. It witnesses heavy traffic althrough out the day. When is it going to change or do we have to live with it. first many congratulations for having a good website. there were reports of many buildings and flats inundated with floods in the last season...how can it be avoided in future and what was done for people affected at that time. can corporation step in for regulating of auto fares in the city. * Probably have a system which atleast closes the potholes regularly, if not re-lay roads. * Have SWAT teams to oversee other important tasks so we seriously can expect some proper action...just like the flying squad which check if people traveling in the buses have bought tickets. * Make sure schedule power cuts last through what is communicated and not 'at will'. * Work seriously to have some sort of moral policing(for the right cause:-) not the ram sena kind :-) ) in how people cross roads or how vehicles stop/navigate through traffic. What is the three important things he thinks people should expect from Chennai Corporation at his times? What are the three things he expects from a common man's end ? I have few questions for the Commisioner. 1)City's cleanliness- What steps are they going to take / laws to be enforced so that we can have a clean city? 2)Waterlogging Prevention- Why is Chennai Stinking in Rainy season? Cant some steps be taken in summer to set right the roads damaged during that time as well as improving the drainage infrastrucutre? 1)Safety of lone people in home(housewives, senior citizes) as we had a gruesome murder in Ashok Nagar on December '08. Thanks Chinmayee for giving me the opportunity. Surely i should appreciate for al of ur achievements and al the best for ur future success. Inspired a lot from reading ur interview given to hindu, it is for sure this wil make u a good icon n role model for coming generation. I want u to bring this to commissioner that there some traffic police used to stand regularly in old mahabalipuram road to catch vehicles exceeding speed limit jus opp to a software company.In the name of spot fine they collecting huge amount from those who are caught by them saying they came over speed.Actual speed limit is 60 but they stop sometimes even if we go within speed limit and asking us to pay spot fine telling ur speed is detected by device. Hi, I've got a question that you can ask on my behalf. A famous politician hit the town recently. There were scores of people lining up to welcome the guy. I was trying to park my vehicle closest to the place where it would be convenient for me. Then, up comes a lady in uniform, asking me to take a roundabout of more than 1 KM just to get to where I had initially set my mind to park my chevy. I try to talk to her, but she ain't going to agree. Soon, a guy in uniform joins her and starts arguing. There are always double standards in our country. If I had continued to stick my neck out, I would have been whisked away, either by the policemen or by the supporters of the politician. I hate these guys. All I could do was swear in my mind at the people who get paid by the government. What are the basic things he expects from the general public (What they need to do from now on), to make Chennai a better city. Now you know where do I. Until I visit your site I did not know waiting for your appearance on the show. You are so soft with contestants & I did not see you hurting any one. good luck . move my comment to the right place if it is not belong to the subject/ out dated to you. I Just like to say thank you for your stage hosting.Your ability on that is amazing. wow you have this much abilities! Build on your strength.You too win awards like the great A.R.Rahman. ( Am I using more Srinivas phrases? sowie!! Miss you Chinmayee! Good initiative from you Chinmayee. Wanted to post a suggestion to Corporation Commissioner. To keep the city clean, CLEAN, very CLEAN, we need to keep dustbins at every 10 feet or possible shortest distance. Definitely, our people got improved in chennai with atleast an educated member at home, this would achieve the purpose of creating cleanliness sense. Atleast in every bus stop, the dustbins are to be placed and they are to be cleaned out in specific intervals. I have one more question to be forwarded to the Traffic Police. It would be great if you could get this across to them. 1) Why are Traffic Signals switched off after 10 PM on main arterial roads. Eg Sterling Road- College Road Junction, 2) Koyembedu Rountana. We have to hold our lives and then cross these junctions. I agree there would be people who violate and jump the signals because of night time, but if the signals are switched off by the authorities themselves, it leads to severe hardship , confusion and risk to the motorists. 2) Secondly, the city is facing severe shortage of parking space. Why aren't the authorities converting available space as parking lots. Space beneath newly constructed flyovers can be used as pay parks. Eg. Flyover in front of Music Academy has been closed and some greeney has been proposed. Yes the city needs greenery but more important is the provision for parking across chennai city.